Urban Oasis offers expertise in all aspects of playground design and landscaping. 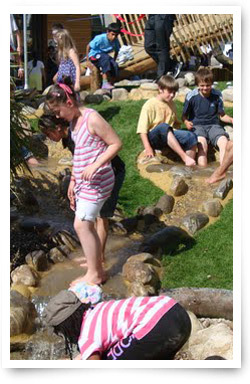 We were the landscaping and gardening contractors for the successful adventure playground at Waterside, WINNER of the innovation award at Playground of the year 2011. We take into consideration all needs and demands of a playground. We widely use safety flooring, whether it is lawn matting and playbark areas to rubber safety tiles and wetpour surfacing which is an excellent way to brighten up areas and stimulate children. We try to involve free play opportunities in our designs for example elevations for hide-and-seek, animal-attracting plants for mini-beast hunts as well as access to nature and natural play elements (trees, shrubs, wild flowers, soil & water, timber etc.). Urban Oasis are aware of the demands on equipment and components in a lively play environment and the potential of �out of hour� use. Our designs incorporate sturdy materials, solid craftsmanship, heavy duty components and weather-proofing to ensure maximum durability in the face of heavy use, exposure to the elements and potential vandalism.